United States relations with what is now Libya have a complex history going back to America’s first decades. 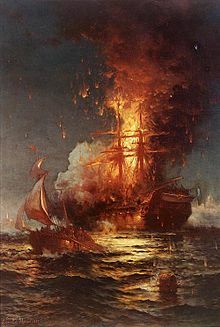 Although two other North African states, Morocco and Tunisia, were among the first countries in the world to recognize the USA diplomatically, the new nation soon fought the Barbary Wars in the Mediterranean over attacks on its ships by pirates from Tripoli—the origin of the “shores of Tripoli” reference in the Marines’ Hymn. President Thomas Jefferson became the first US president to bypass Congress and take the nation to war in 1801. It was the First Barbary War of 1801-1805. It was also a war of many firsts: the first foreign war fought by the US after the American Revolution, the first time an American soldier shed blood on foreign soil, the first time the US Marines saw battle, and the first time the Stars and Stripes were raised over foreign soil after a military victory. It was also the first attempt by the US to overthrow a foreign ruler and install an American-friendly government – an attempt which ended in compromise, not in victory. The mission was embarrassingly abandoned yet oddly commemorated by the Marines who never actually made it to the shores of Tripoli. The “Barbary” states are actually the North African states of today’s Algeria, Morocco, Libya, and Tunisia that were nominally governed by the Ottoman Empire. The Barbary Wars originated from the Barbary Coast pirates’ attacks on ships and crews along the North Coast of Africa. Since the 13th century, Barbary Coast pirates had attacked European ships in the Mediterranean, freeing crews and cargoes only after receiving ransom payments. For a higher price, the pirate states would agree to abstain from taking ships or hostages in the first place. During the 2nd half of the 18th century and before the Treaty of Paris, which granted America’s independence from Great Britain, American shipping was protected by France. Shortly after independence, more than one-fifth of U.S. trade then was with Mediterranean countries. And without the protection of the British and the French navies (then fighting each other elsewhere), American shipping began to fall prey to the pirates around 1784, sometimes at a cost of 20% of the US budget. The need to protect American shipping was a major factor in drafting a new and stronger US Constitution. James Madison wrote in the Federalist Papers of “the rapacious demands of pirates and barbarians,” that should be a good reason for American states to unite into a strong central government. 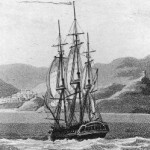 Thomas Jefferson preferred “confrontation with Barbary to blackmail.” US naval squadrons began to appear off the North African coasts to demand liberation of hostages as well as free trade and free passage. 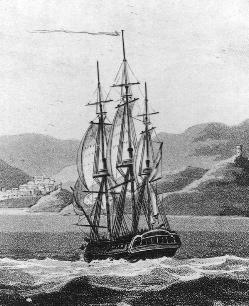 In October 1803, Tripoli’s fleet captured the flagship USS Philadelphia intact after the frigate ran aground on a reef while patrolling Tripoli harbor. The ruler of Tripoli, Yusuf Karamanli, imprisoned the entire 307-man crew of the 36-gun frigate and aimed its cannon at the rest of the U.S. fleet. In February 1804 U.S. Marines stormed the vessel and set fire to Philadelphia. The burning frigate Philadelphia in the harbor of Tripoli, February 16, 1804, by Edward Moran, painted 1897. And the turbaned heads bowed to its terrible glare. Remains of sailors from the USS Intrepid are buried at a cemetery overlooking the harbor in Tripoli. Some may be at a site nearby. Remains of sailors from the USS Intrepid are buried at a cemetery overlooking the harbor in Tripoli. Some may be at a site nearby. (Courtesy U.S. State Department) A bipartisan group of senators is pressing to repatriate the remains of 13 American sailors who died two centuries ago fighting pirates off the Libyan coast. The sailors’ remains have been buried near the shores of Tripoli for 207 years after the sailors died in a failed mission against Barbary pirates. In recent years, a small group of descendants has been seeking to bring them back to the United States. That effort appeared to gain momentum last spring, when the House backed a measure that would force the Defense Department to repatriate the remains. But the measure stalled in the Senate. This week, a group of key senators wrote to the leaders of the House and Senate armed services committees, urging them to include a repatriation provision in the defense authorization bill that’s in conference committee. Although the cemetery was recently restored, the senators said, it remains in jeopardy because of concerns about U.S.-Libyan diplomacy.. The Navy, however, opposes bringing the remains back to American soil, saying it considers Libya to be the sailors’ “final resting place.” Sen. John McCain (Ariz.), the ranking Republican on the Armed Services Committee, has asked the Navy and other defense officials for more information about their views on the issue. The Navy has said it has concerns about the ability to identify the remains. An assessment from the Congressional Budget Office found that repatriating the remains would cost $85,000 to $100,000, according to the letter. The letter was signed by Sens. Dean Heller (R-Nev.), John Boozman (R-Ark. ), John Kerry (D-Mass. ), Robert Menendez (D-N.J.), Jim Webb (D-Va.), Richard Blumenthal (D-Conn.), Scott Brown (R-Mass. ), Frank Lautenberg (D-N.J.), Ron Wyden (D-Ore.) and Olympia Snowe (R-Maine). 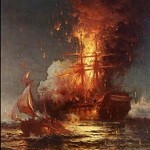 Had Christian nations stopped using piracy as a routine tactic of war by then? The Treaty of Tripoli in 1797 is also very interesting. Its 11th item stated that the United States is not a Christian Nation. My father used to quote a poem about the Barbary Pirates years ago. Now I can’t find the author, or the title. Can you help me? All I have is the first stanza. When the Barbary Pirates ruled the coasts and waged their cruel wars. Do you know who wrote this, and can you tell me? When the Barbary Pirates ruled the coast and waged their cruel wars. Has anyone out there ever seen this poem? In actuality, Congress authorized President Jefferson to instruct the commanders of armed American vessels to seize all vessels and goods of the Pasha of Tripoli “and also to cause to be done all such other acts of precaution or hostility as the state of war will justify.”. Although Congress never voted on a formal declaration of war, they did authorize the President’s actions.